Are you looking for the best mesh WiFi 2019? Well you are at the right place, various companies have been offering and claiming to be the best but fact remains, only one can be the best and given the top rank. Well, we have been working and made out the best possible ranking based on different features, power and price tags. WiFi-extenders have long been a popular option when it came to solving WiFi dead spots at homes and offices. Having the best mesh WiFi network is the need of the hour everywhere. So you should buy it or not is not debatable at all. The real question is, How to find the right product? For that you have to through out buyer’s guide best mesh WiFi 2019 at the bottom of the article, it will give you a clear idea of, how to find the best WiFi extenders 2019? Mesh WiFi system consists of more then one routers. These routers are deployed at different spots, work together to blanket the WiFi signal over the whole house. It works same as WiFi extenders but very easy to set up and also doesn’t require a completely different network name and other quirks same as WiFi extenders. Mesh WiFi has been around for quite a while, Eero was the first one to introduce the mesh WiFi. Later on, giants like Netgear, Linksys, and Google have stepped in. After thorough research, I have made a list of best mesh WiFi 2019. Do you want a Mesh WiFi with powerful security features and full control over the wifi network? Linksys provide us the most tweakable WiFi controls and powerful security features. I have rated Linksys Velop as one of the best mesh WiFi 2019 because it comes with best features, beautiful design and super easy to set up. Linksys promises the best WiFi mesh network, which is accompanied by an app. The application makes it super easy and super quick to set up. They give us three identical units which work in sync to cover all the dead spots in the corners, over the next floors and beyond the thick walls of the building. WiFi extenders blanket every corner of the house small or big and makes it one of the best mesh WiFi 2019. 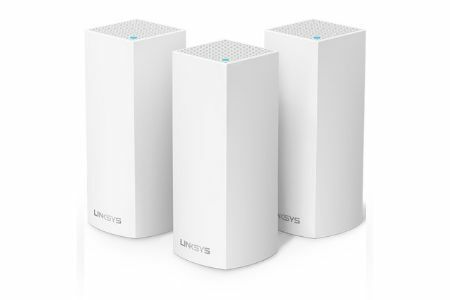 Design of the Linksys Velop makes it out of the crowd with three white towers having internal antennas and slightly curved at the base. Top and two sides of the tower are used for the heat dissipation having hundreds of holes. While at the hollow section underneath, there is a plastic clip. This clip contains ports for the Ethernet connection, a button for power off and on and DC connector for powering up the unit. Also, password and username is mention on this clip, which is not used during the setup process. The beautiful design, Tri-Band streaming and easy to set up makes it one of the best mesh WiFi network 2019. Each unit contains two port for the Ethernet connection. One of the port is connected to the Modem during the setup process, which leaves us with one port but each next units adds two more ports. Laptops, Mobile devices, and even desktops PC’s can be connected wirelessly to the mesh network. The Linksys Velop mesh system box comes with three towers like units plus a thin Ethernet cable and two-meter cabling nicely packed. Setting up couldn’t be easier, connect the unit with the modem through internet cable and power up the device using the 12 DC connector. Now it’s time to download the app and enjoy the seamless connectivity of best mesh WiFi 2019. The first thing you need to do is download the Linksys Velop app from the Android or IOS app store. Lunch the application, and it will ask you for “Where did your internet connection come from?”. You can select either of them based on your connection. The next step is to gather your items, the node, 12 DC connector that came with the box and an Ethernet cable. Plugin the node with some power source at your home, place the node out in the open where you can get the best signal. Now it’s time to connect your modem with the mesh WiFi router using the Ethernet cable that came in the box along the device. Node takes some time to fully startup. There is a button on the top of the node that blinks blue, wait for it until it turns into solid purple. Tap the button. This node now broadcasts its WiFi signal for the setup purpose. Go to your mobile settings and connect to the WiFi using the WiFi name and password mentioned on the label underneath. After successfully joining the WiFi through the Android application, open the Linksys application and tap the next button. After some time, the light ring on the top of the unit will turn in blue color which is the indication that a connection has been successfully established. Now its time for adding another node to the mesh network using the same process. The user needs to go through the same process for the addition of a new node to the mesh WiFi network system. The box also contains guidebook for the setup which includes easy steps for the configuration of the nodes. The interface for Linksys application is very informative and detailed if you disconnect one of the nodes from the mesh WiFi network system. The android/IOS application notifies the user about the node that’s disconnected from the network. The main display of the application is quite easy and evident which contains the basic functionality of the application. While the advance setting of the application can be accessed from the menu on the left side of the application. I have rated it the best mesh WiFi because of its beatiful design and super easy setup. Linksys Velop has been tested by speedtest.net. In the short range it worked normal as a WiFi extender, but by moving away from the node, the speed degraded as the distance increased. After deploying the second node, the speed again increased but not to the level as expected or to the degree as at short range. So you will need to select the best spot for the node to deploy to avoid the thick walls and get speed as much as it is possible. Perhaps there is a lot of work to be done and can be improved a lot, but still, up to date, this device is a beast and one the best mesh WiFi system till date. No matter this is a long way to go to improve the performance, but still, this device is a great device to be used. If you are searching for a stable internet throughout the whole house and want to build an excellent WiFi mesh network. This product is the only answer to your prayers. It has a stunning design and has the ability to cover from medium to large houses and provide stream-less connectivity. You can call it the best mesh WiFi 2019 for large homes and building. This product is best mesh WiFi under 500$. To get stable signals throughout the whole house is not an easy job, no matter how powerful is your router. A lot of different companies have been trying to solve this problem through ages. Netgear Orbi mesh wifi sytem is not the first one to try this. I won’t say that Netgear Orbi completely solves this problem, but I promise that it is one of the best options you have to get signals over the whole house. Netgear Orbi comes with two devices, a mesh router, and a satellite device. It’s one of the toughest competitor of the other giants in the league of best mesh WiFi 2019. They always come with new features, stronger routers and appealing design, this is why, i have ranked them one of the best mesh WiFi extenders 2019. 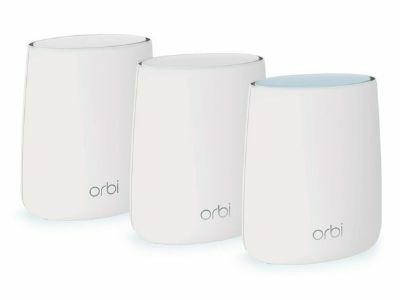 Netgear Orbi mesh WiFi system has a very attractive design, you can place them anywhere at your house. The box contains a router, satellite, Ethernet cable and DC chargers to power up the satellite and router. Both the 1.96 pounds’ devices are quite identical in shape. The only difference between the router and a satellite is upper side, which is different in color. The upper side of the satellite is pure white while on the other end the router is blue on the upper end. On the back of the router, there is a WAN port (To connect your device to modem), three LAN port (To connect to other internet devices), a sync button (which can be used to sync the device), a USB 2.0 port (for connecting network storage) and also a DC port to power up the device. When we talk about the satellite, it also has the same but instead WAN port, a LAN port is added to it. Setting up Orbi is quite comfortable even without have an application for it. The Orbi lid on the top has LED ring under the plastic sheet that shows different colors rings and each color tells us the stability of the connection. Which means following those colors you can place the Orbi satellite at a perfect place. The setting couldn’t be easier; all you need to do is connect both the devices with the power source through DC charger. After connecting the with power source press, the Sync button on both the devices and magic happen. Both the devices start to connect, which you can observe through the LED lights ring glowing on the top lid of the devices. As you move the satellite, the colors of the LED will change. The pure blue light tells us that the connection is stable now, the amber color ring tells us the connection is fair while if you see a magenta ring that means the connection is weak. Netgear Orbi mesh router is a 2×2 router that works on two streams of data at the same time. If you see a dedicated back-haul channel, it works 4×4 radio channel. But Netgear Orbi on the other adds up MU-MIMO WiFi technology that helps in connecting several devices at the same time. Orbi has a powerful processor of a 710-MHz quad-core ARM-based processor with 512 MB random access memory and 4 GB of flash storage. It also has Qualcomm’s IPQ4019 WiFi control chip, which controls the back-haul data channel. Netgear Orbi has been tested with a result of 552 Mbps at 5 feet. Which is quite faster than Google WiFi (19 percent), Linksys Velop (34 percent) and Ubiquiti AmplifiHD (50 percent). As increased the distance, the speed decreased along. Which makes it the best mesh WiFi router at a time. If you compare Best Mesh WiFi network system with the conventional router, the difference is day and night. With the Netgear Orbi best mesh WiFi system, you enjoy the fast internet even in the basements and stream Netflix without any buffering. All this is possible because Orbi broadcasts its signal at three different frequencies. One of them is 2.4 GHz, another is 5 GHz and also another 5 GHz which is locked from access. If we talk about the sync of the devices, if one of the devices is accidentally powered off or unplugged. Sync of the devices to work as usual again is a mess. Sometimes you have to reset both the devices to work in sync again. But as I told setting up isn’t that hard, so a little hard work can get you great WiFi. If you compare if with traditional best wifi extenders 2019, you will experience a great difference. Google WiFi mesh has tiny units that can be placed or hidden anywhere with a diameter of 4.1 inches and a height of 2.7 inches. It’s way smaller than the Netgear Orbi 8.9 inches’ tower but litter bigger than the Ubiquiti Network 3.9 inches. If we talk about the design of Google WiFi, it’s so beautiful and appealing. They have LED rings around the device, which glow in different colors and shows the status of the network. If you see a blue ring around the device that means the connection is stable, but when that ring turns into amber color, that means the connection is now severe. 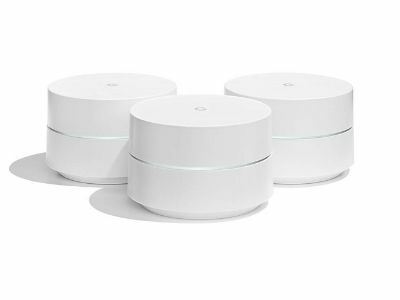 Google WiFi Units comes at a price of 129$ each, and you can get a set of three units at a price 299$ which is quite inexpensive than other WiFi mesh networks such as luma, Eero, Orbi, and Linksys. if you are looking for budget friendly device along good connectivity, then this tops the list of best mesh wifi 2019. The price is very budget friendly and competes many of the traditional best wifi extenders 2019. Google WiFi uses 2×2 MIMO technology that streams dual frequencies simultaneously. Google WiFi claims that it has 1.2 Gbps speed. This WiFi mesh network has five antennas surround the unit circumference powerful signals. Google WiFi claims that it can cover up to 1500 square feet distance with a single unit deployed which is quite enough for small apartments or buildings. By disposing of all of the nodes, it can cover up to 4500 square feet, which can even cover a large building or villa which makes it one of the best WiFi mesh 2019. 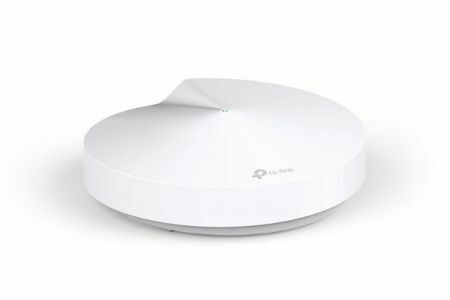 If you look on the lower side of the Google WiFi mesh network has Type-C USB power port to connect the device to power, a WAN port to connect the unit to the broadband modem and an Ethernet port to connect other Ethernet devices to the unit. Google WiFi Mesh Network is one of the easiest to set up. The first thing you need to do is download the IOS or Android app. To run the app, you will have a google account to set up the device. Then set up couldn’t be easier, you will need to enter the printed code or scan the QR code on the Google WiFi unit. After scanning the device makes a quick Bluetooth connection with the mobile device. Finally, Google app will ask you for network name and password, and you are good to go. The same process can be repeated for the other units deployed. Google also provides helpline 24/7, which can be used if you have any problems regarding the setup or any other connectivity issues. Also, Google offers a 1-year warranty that can be availed in case of any faults in the device or issues. The performance of the Google WiFi system is quite impressive. But the Google WiFi handles only two lanes of traffic, which makes it a step behind of other best mesh WiFi systems like Linksys and Netgear. Those other best mesh WiFi routers handle three lanes of traffic. The other best mesh WiFi networks uses MU-MIMO technology to manage multiple users at the same time, which on the other hand google lacks that ability and uses MIMO. It may lack MU-MIM0 Technology but considering the price and other features they provide, i have ranked them one of the best mesh wifi 2019. Google WiFi unit has a powerful ARM-based quad-core processor 710 MHz, with 512 Mb ram and 4 GB flash storage space. It uses IPQ4019 WiFi radio and control chip. Google WiFi units are a true mesh wifi network, cause every node is a satellite and router itself. 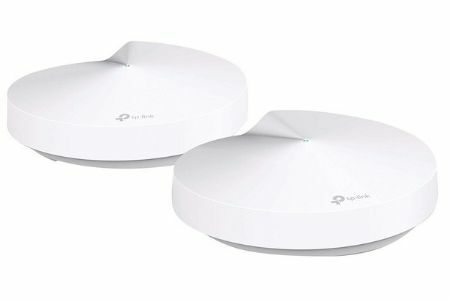 When tested at a different distance, The Google WiFi mesh network was very impressive but not as remarkable as other costly mesh networks like Orbi and Linksys. If we look at the price of the Google top rated mesh WiFi systems, It is the best we can get at this price. Despite all the comparison with the other top rated mesh WiFi networks, the lower price, tiny devices and the most beautiful design gives an upper hand on all the other devices. If you live in a small apartment, then Google WiFi is the Best WiFi Mesh 2019 for you. With all the units deployed, It can cover the big houses. But if money is not a problem for you, then you should go for the Orbi or Linksys Velop because it provides you stable internet on considerable distance. As Other best mesh wifi networks, TP Deco M9 mesh wifi network also uses units to achieve seamless WiFi coverage over the whole house, to eliminate the dead spots and weak signals once and for all. The advanced technology of the deco m9 plus work in sync with the same network name and password. The devices automatically switch and connect to other Decos as you move through the house. The three pack of Decos covers up to 6500 hundred feet of distance; you can add further Decos to add more coverage space. The kit of three Decos provides a stable and speedy internet at a speed rate of 2134 Mbps. You don’t need to buy a separate hub, Deco mesh wifi router itself acts as a hub for all the smart devices like laptops and mobiles. It claims to provide lag-free connection even if 100 devices are connected at once. TP-Link Deco M9 best mesh wifi network is quite similar to the previous version M5. They kept the same design, but the deco M9 plus mesh wifi sytem is more prominent as compared to deco M5 mesh wifi system, which is a little harder to shift and hide somewhere at a window shelf. Generally, it’s a beautiful circular design, with the dimension of 5.7 in diameter while 2.5 inches’ height. It makes an adorable design with classy white color units. On the side of the Deco node, there two LAN/WAN Ethernet ports for connecting the unit to broadband or other Ethernet devices, USB 2.0 port and 12 DC power port. Inside the box, comes three units of Deco M9 plus that work in a mesh, three power adapters, one for each unit and RJ45 Ethernet cable for connection to the broadband. Box has a different variant, Pack of three, two and one also available. Like all other mesh variants, Deco M9 plus mesh wifi also comes with a LED light on the top, which shows the status of the connection. The green color indicates that everything is working correctly and connected, while if the device is in configuration stage a yellow, pulsing blue or blue color will be shown but if something is wrong, the LED gets red. Which is at a very rear occasion, if something happens, look at the app or go for a reset. There is nothing that a reboot won’t fix. The first thing you will need is to download the application for Deco M9 plus from the Android or IOS app store. Installation of the device is very straightforward. Update the firmware of the devices and then follow the simple guidelines provided by the application. The interface of the Deco m9 plus mesh wifi is very simple and straightforward. The sophisticated features are out of the way of the normal users. They run in the background. Once the devices are carefully placed, and the firmware is flashed to the latest version. It’s time to use them. Deco m9 plus mesh wifi network allows to control and observe the status of all the devices that are connected to the network from the application interface. It also has a built-in feature to check the speed of the internet. Deco M9 plus mesh wifi uses dual stream frequency of 2.4 GHz (speed up to 400 Mbps) and 5 GHz (speed up to 867 Mbps). To mitigate the weak signal Deco M9 plus uses Ethernet back-haul, which means the connection will be faster and smoother than older version M5. The TP-Link Deco M9 plus works on TP-Link Mesh network technology, with MU-MIMO (Multiple User, Multiple inputs, Multiple outputs) WiFi configuration. M9 plus is compatible with Alexa, which means you can control your home WiFi system with your voice commands. The great feature makes it one of the best mesh WiFi 2019. The Deco M9 plus is ridiculously easy to set up and configure. It provides great signals over the house to cover the corners of the house. The size is of the device is a little bigger, but it won’t be a problem, you can hide it anywhere in the house. The services provided by the application is excellent. The security features, parental controls, and the smart hub feature is a plus. It’s a little pricier, but what it offers in exchange, the price is worth it. Ubiquiti AmplifiHD has now joined the list of best Mesh WiFi routers, which uses additional WiFi units to spread the WiFi signal to every corner of a house. top rated Mesh WiFi extenders are getting very popular because they are very easy to set up and effective of ensuring that all the devices can access the internet throughout the home. Ubiquiti AmplifiHD is very uniquely designed, easy to set up and provides solid signals throughout the whole house from a mid-range to large sized house. They are little overpriced and have to face giant competitors like Netgear, Linksys, and Google. Overall, the tremendous design and features make it one of the best mesh WiFi 2019 and are worth spending. Ubiquiti AmplifiHD mesh wifi network has a unique design that you have never seen before. The mesh WiFi extenders market is crowded by giants like Google, Linksys, and Netgear wifi mesh systems. To outclass these giants, one needs to stand out of the crowd. Ubiquiti AmplifiHd mesh wifi achieves that by making an increasingly interesting design and great features. If you look at this device, it’s so adorable; you don’t need to hide it somewhere around the house. Ubiquiti AmplifiHD mesh wifi system doesn’t have any antennas or switches and looks more like an alarm clock then some tech product. 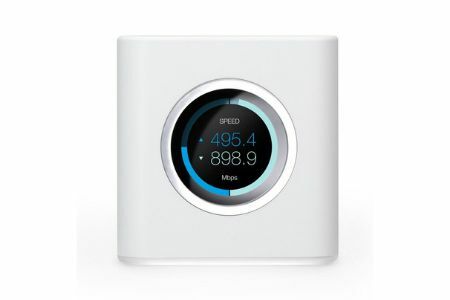 If you are a fan of Apple products and doesn’t care about the price, Ubiquiti AmplifiHD mesh wifi network is then the perfect choice for you because the is an obvious influence here. Unlike all other best Mesh WiFi systems, Ubiquiti AmplifiHD introduces touchscreen in the router device that shows day, date and time. If you tap the touchscreen, it shows you the data that has moved out and in of the router. Tap it again and it will show you IP Addresses of WAN, LAN and also shows you all the devices connected if you tap more then once it takes to speed meter. The touchscreen provides us with basic functionality, complex functionalities like configuration are done through the application, which makes it the best mesh wifi 2019. Ubiquiti AmplifiHd mesh network is based on 3×3 MIMO technology. It’s a high-performance router that contains additional two Ubiquiti Mesh wifi point or nodes. 7.1 inches long. WiFi extenders of Ubiquiti AmplifiHD mesh wifi Looks amazing like work of modern arts. You don’t need to place them on a window shelf; they can be directly plugged into the socket and connected wirelessly with the main Ubiquiti router. LED lights are there to show the signal strength. The power socket is connected with another half of the Ubiquiti Mesh point through a magnetic ball, which let us the 360-degree movement of the antenna for better signals. Ubiquiti AmplifiHD also has ports on the back of the router, four LAN port RJ45 for downstream, USB 2.0 and Power Adapter. On plugging the Ubiquiti AmplifiHD, the screen of the device lights up and ask the user to download the application from the Android or IOS app store. You can also touch the touchscreen on the front of the Ubiquiti AmplifiHD for more options. The application takes you through an animated video, which makes the setting up of the device pretty easy. The application quickly finds the Ubiquiti AmplifiHD router, and start the WiFi configuration. The application takes us through the easy steps to set up the device, plus provided with a touchscreen display, makes it the most straightforward configuration of the device ever. You will need to enter a username and password to set up. Once the router is configured, now it’s time to plug in the WiFi extenders, it will take a few minutes to connect. The five LED signal strength meter on the front of the router will help in placing HD mesh points or extenders. The process of the mesh wifi system is so easy and straight forward. You don’t need any special skills. If you face any problems, Ubiquiti Technicians are available for online chat and email 24/7. You can also call them through their helpline, from 5 am to 9 am on weekdays. The Ubiquiti AmplifiHD mobile app also has the feature to initiate an online chat with Ubiquiti technicians. Performance is the most important part of any best WiFi mesh systems. AmplifiHD provides you with a very good performance as far. Even with no external antennas, it does a great job, covering all the dead spots, corners, basement and floors. On the other side of the thick wall or different floors, it does drop the performance but with the addition of Ubiquiti mesh points. Ubiquiti AmplifiHD mesh network gives us the same speed even on the third floor as you are sitting along the router. So, the performance of the Ubiquiti AmplifiHD is more than good enough; It gives solid signals to every corner of the house. Ubiquiti AmplifiHD is for Mid-range to large sized houses. If you have a small house, you won’t even need MeshPointsHD, because the Ubiquiti routers can cover it with solid signals. The Performance beats many of the other best mesh wifi routers till day. If you are a fan of tweaking with the setting of routers, Ubiquiti AmplifiHD allows you to toggle with the settings. It provides you with a great functionality of advanced networking tools, port forwarding, and guest network access. The UbiquitiHD is the easiest to set up. The application is highly user-friendly. This is a very great device, if you look at the design of this device. It quietly resembles apple product designs. If someone wants a product, which looks great and can displayed anywhere at home then this is the right choice. This device is also less expensive and have a tremendous throughput. It provides solid signal over all the corner of the house and is one of the great best mesh wifi 2019 to buy. It’s been time since mesh WiFi extenders have arrived the market but the high prices have kept them out of the hands of the majority of people. Deco M5 mesh wifi extender aims to change that because it is something which is quite cheaper and affordable. Like all the other top rated mesh WiFi systems, Deco M5 mesh wifi extender box also comes with a pack of three units. In the age of Wonder mesh WiFi home routers, Deco M5 mesh wifi extender is another addition to the crowd. like all mesh routers, it also aims to extend the WiFi signals throughout the house with the help of mesh WiFi extenders. With a great performance and affordable price, Deco M5 is one the best mesh wifi 2019. The important aspect of these routers is, it’s completely different in design from the traditional routers. They have made a very simple design that gives a super decent look. The other traditional routers had antennas outside the router but the new mesh router deco m5 has completely changed and stuff antennas inside the router. This has a very great impact on the desing of the mesh routher and give them a super decent look. Like all other Mesh WiFi extenders, Deco M5 mesh wifi have also LED light, the glows in different colors. LED light shows us the status of the connection. If it glows red that means, there is some issue and it needs our attention. If you see an orange or blue color that means the router is being set up or configured. While if it’s green that means everything is okay and connected. Deco M5 smartphone application has many features that shows us common stuff like how many devices are connected, the status of the devices and throughput users are getting. The interface of the application is very simple and easy to use, you don’t need to be technically aware. Everyone one will able to toggle the setting in a very short time. The easiness, effectiveness and low price makes it one of the best mesh wifi networks. All the units are very attractive and beautifully designed. Deco M5 mesh wifi extender has a round shape with an LED light and different ports for connectivity. It has a pair of Ethernet ports, to connect the device with broadband or other Ethernet devices. To connect the device with AC power, it has a Type C port as a power Adapter. It lacks holes for wall mounting and is very similar to Google WiFi. Installing and configuring the Deco M5 mesh network is super easy and doesn’t require any special skills or technician. To install you will need to download the accompanying application from the app store, which is available for both Android and Apple products. The app is easy and simple, guide you through simple steps to set up the network. The Deco M5 mesh wifi doesn’t require any email account. It uses Bluetooth connection to connect the smartphone with the devices. After a successful connection, it will ask you for a network name and password. All the three units use the same network and password. After setting up the router, its time add the other mesh points, which is a similar process takes 5 to 6 minutes. In around 15 you will have your device configured and ready to use. TP-Link also provides Trend Antivirus subscription for three years for the security purpose, which makes it stand out of the crowd. There is also feature for parental controls, and keep one’s out of the No-Go territory. If we talk about the performance of Deco M5 mesh wifi systems, it focuses more on coverage of the device rather the throughput. The device has very strong coverage, as compared to the traditional router. With the added mesh units, it can cover from Midsize to big houses. It may be not as powerful as other top rated mesh wifi giants like Netgear and Linksys but if you really care for the price then this beast can provide great signals around the house for very less amount of price. It may not provide you with the best throughput but connecting all the Deco units, it can surely fill every corner of your house with solid signals. It will provide with a seamless coverage while roaming around your house, jumping from one device to another without your notice. If it’s a start for you and cannot afford bigger products like Netgear and Linksys, this is the best mesh wifi 2019 for you. The best thing in this device is the affordable price and user-friendly interface (easy to set up). This makes it a very good choice for purchase. There is a slight down in the throughput of the device. It may not compete with powerful Netgear or Linksys but if you carefully look at the price, it provides more than expected. Lower price, good design and easy to set up makes it the best mesh WiFi 2019. The square-shaped futuristic-looking design on the WiFi mesh device is one of the appealing things the Tenda MW6 Nova Wave 2 has to offer. In fact, the overall device is following the white color and the most important thing that I like about the device is the mode light that gives the indications of different modes. The engraved lines on the best Mesh WiFi 2019 looking incredibly awesome. Moreover, just below the indicating LED, you’ll find out a nice looking Nova logo adorning the WiFi router. Speaking of this Rubik cube looking mesh WiFi router is hence another interesting part of the game where the frequency on the device is able to hit the 6000 square feet of the area allowing you to connect the WiFi from the longer distances. Here is the interesting part. You’re getting the 128 Mb of RAM on the Tenda MW6 Nova Wave 2 along with the 1 GHz of processor making the best mesh WiFi network more convenient. Moreover, the router allows you to connect the multiple devices with the help MU-MIMO feature powered in there the MW6 Nova Wave 2 mesh WiFi system device. We’re not done yet, the device has even more to offer. The Ethernet ports and the power jack are also in for easy charging and another wired internet connectivity. Tenda has done their homework, It’s very easy to set up. You won’t need any technician or any extra skill to deploy the router at your home. The mesh WiFi app is available for Android and IOS both the platforms. All you need to do is scan the QR code on the base of the device, to connect the new Nova wave device to the internet. You will be asked to setup the network name and password to configure the mesh wifi network. After the configuration and installation of the mesh wifi router. Now, it’s time configure the other satellite devices. Each device has an LED, which tells the status of the connection and helps in the placement of the satellite devices. The app has the ability to show all the mesh points and connected devices, it also monitors the speed of the internet. There is also an option for setting up quest network, and parental controls, to help you out to restrict access of sites. It’s quite good, if you want to restrict your kids from certain sites. Overall this mesh wifi network device is very easy to setup and very great option to carry home. Nova wave is a great wifi mesh device for normal users, if you want to just browse the internet, music or stream videos. Compared to the high end tri-band devices, its performance is fairly modest but if you look the price gap, there is a huge difference. With mobile connectivity in the same room as router, the speed of Nova wave is quite respectable as compared to other top rated mesh wifi networks. The real challenge is long distance devices, at the other side of the house or the basements. The performance degrades with the increasing amount of distance, but it’s still better than the other traditional routers. 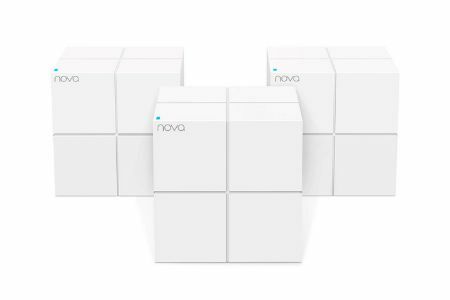 Looking at the great and affordable price Nova wave, this best mesh wifi device will be my choice for you to buy, if you have a medium house. This device is easy to setup, has great features and good performance. Overall it’s a great device to buy and carry home. If you have a large house, then you should consider for more powerful options like Google WiFi or Netgear. This device has very low prices, and if you are out of budget then this could be the best option for you because it is way better than the traditional home WiFi router. It you want one of the best mesh wifi 2019, then this is the right choice for you. It will give you solid signal through the whole house with just a little bit low throughput. Browsing through the internet, playing music or streaming Netflix videos will be perfectly fine. Eero was the first one to introduce WiFi mesh network. It was started by a small company in sans Francisco, but later on, other giant tech companies started building best mesh WiFi systems. Giant companies like Google, Netgear, and Orbi are in play now, and the competition is getting worse over time. For the reader, who has a reasonable budget we recommend you to buy a big product like Netgear Orbi or Linksys, but if you have a low budget, you should go for the Google WiFi. Eero also provides the ability to add as many nodes to the mesh network one want or needed per house requirement to carry data from one corner of the house to another. Theoretically, you can add as many nodes as you want but with the addition of each node, the performance of the mesh network degrades with each hop. Other mesh network system like Netgear Orbi or Linksys mitigate this loss by using the third band of radio, but Eero isn’t one of them. Likewise, other top rated mesh WiFi system, Eero also has an LED that changes colors. Each color shows the status of the router. Eero turns blue when it ready to be configured. After the configuration, when the device gets online the color of the LED changes to white, and it gets red when something is very wrong. Each Eero mesh WiFi node has 2×2 SU-MIMO (Single User, multiple inputs, multiple outputs) WiFi configuration. This device has four can antennas, that’s capable of connecting with laptops, mobiles, and other client devices with a similar configuration on both frequencies 2.4 GHz and 5 GHz. Like other mesh WiFi routers, Eero doesn’t have MU-MIMO WiFi configuration. Which means it’s not able, to communicate with multiple user devices at once, each device has to wait its turn. 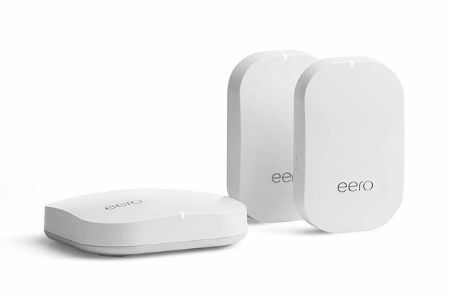 Setting up Eero is as easy as other WiFi mesh systems. You just need to download free application IOS or Android from the app store. Install the router and set a username and password for the router. After that connect the router to the power supply through DC charger and connect the router with the Mobile application through WiFi. Eero also allows you to add more than the box includes, if you have a bigger house, adding a new unit won’t be a problem. The device has full control over the network. From the mobile application, you can control the network and control the users connected to the network. It also has built-in features for parental controls and adding guest users. Eero units are connected in a mesh network, peer to peer connection but when users want to communicate to Eero devices. They see these devices as one, with the same username and network name. Eero units are powered with a 1 GHz quad-core processor, 512 Mb RAM (random access memory) and 4 Gb flash storage. It uses Qualcomm QCA9882 WiFi chip. Eero uses the dual-band 2×2 SU-MIMO configuration. Like Google WiFi, its entirely different from the tri-band mesh wifi systems like Orbi and Linksys, which uses the MU-MIMO WiFi configuration which is better equipped and are more powerful. When you use Eero as a single router, it has a compelling radio. When tested it beat every other single point router at 5 feet. But when talking about WiFi, it acts well as a wifi mesh network. One great thing about Eero is that it provides full control over its application. It’s the one of the most customizable and deeply tweakable mesh WiFi system. If you are one, that wants complete control over the network, then Eero is the perfect choice for you. Eero WiFi mesh network is very pricey and its worth it. The Product is excellent and is worth spending, but if you look at the competitors, you will have a better option than Eero and even at a lower price Like Google WiFi, because Google is less expensive and more potent as compared to Eero. Although Eero is the ultimate version for the technology geeks that want complete control over the performance and security before you click the buy button you should think, whether you want that much of power because other primary devices offer the same with a less control. Samsung is another addition to the league of mesh WiFi routers. Samsung router has a very affordable price. So why should one buy a traditional router, where Samsung provides a smart router on the same price. Also, another basic router can’t be controlled, configured through a smartphone application. Samsung saw a small hole in the WiFi mesh system, and along WiFi Mesh it also acts as smart hub. Samsung router has the edge over other mesh WiFi routers because it provides a smart router. Samsung smart things can connect to all the smart devices at home, like TVs, lights and control the devices through a smartphone application. Samsung applied the idea by making the Samsung router a place where all the smart devices at home communicate. So, basically this device WiFi mesh system and as much good any other mesh WiFi routers, but it has the edge over other devices because it is also a smart hub. It makes it one of the best mesh WiFi 2019 routers till day. Like all others WiFi mesh systems, Samsung also has designed its mesh router with a decent design. Each Samsung unit is a white mass with a Samsung logo on top of the nod and there is also a LED light that glows red and green, showing different status of the router. Samsung mesh points have the same connection so that any point can act as a router to the network and all the other mesh points will act as satellites. Samsung Smart thing device is very small in size like TP-Link and Eero and can be easily hidden somewhere in the house. It has a dimension 4.7×4.7×1.2 inch devices, which is slightly smaller than Eero mesh points while on the hand looks tiny if you compare it with Netgear or Linksys. Rather plugging directly into the AC outlet like the AmplifiHD, Samsung smart things devices use an external AC power Adapter for plugging into the AC outlet. It has input and output ports for Ethernet connection but lacks USB 2.0. It also has rest button for resetting the device to its factory settings. All the Samsung Smart thing device is the same, and everyone can be configured as host, which makes the set up simple, easy and flexible. It has an LED, which blinks red or green. It changes colors and helps us in noticing the status of the router. Green means everything is okay and connected while blinking red means something is wrong (For example router is overheated) and solid red means no connectivity. Samsung Smart-things device use dual-band 802.11ac mesh router. It has 2×2 mesh router that has a speed of 400 Mbps at 2.4 GHz and up to 866Mbps 5 GHz channel. It lacks the third band like others Netgear Orbi and Linksys which is dedicated to internal connections between the router and mesh points. At the inside of the router, it contains seven antennae’s, two tow antennas are dedicated to each 2.4 and 5 GHz while Bluetooth, ZigBee, and Z-Wave each get one antenna for connection. If you are living in a large house, Samsung Smart-thing can connect 32 devices simultaneously. If you are trying to install or configure Samsung Smart-thing device with any other WiFi app or web browser, then you doing the wrong thing. You will need to download the Samsung Smart-thing Dedicated app from app-store, which is available on both android and IOS devices. Likewise, all other WiFi mesh points, Samsung Smart-things is also very easy to set up. The first thing you need is plug in the device into an AC outlet. After some time the LED starts blinking green, now it’s time to launch the Smart-things app on the smartphone. The app will ask you to add a new device, after some searching the app will find the router device, and you will be able to successfully connect the router with the smartphone. After the successful connection, now it’s time to configure the device. The first thing you need to do is to create a network within the app and agree to the License agreement, the app will ask you for Network name and password. Bingo! Now it’s time to add the other two mesh points to the networks. You can also identify the device by specifying its location at home. This makes it super easy to differentiate between the mesh points. It will take you fifteen minutes to configure all the device and create a mesh. 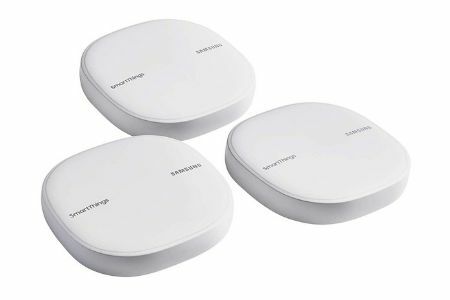 Like all other WiFi mesh systems, Samsung Smart-things device has 710Mhz ARM processor. It works on a dual-band radio rated AC1300 frequency of 2.4 GHz (400 Mbps speed) and 5 GHz (866 Mbps speed). Each unit of Samsung Smart-thing used to beam-forming on 2.4 and 5 GHz and cover up to 1500 feet distance. Each unit of a Samsung device can cover up to 1500 square feet distance, which is quite enough for small homes, you won’t even need the satellite devices. One’s with bigger houses, Samsung three units combined can cover up to 4500 square feet, which is Samsung as Google WiFi and Linksys Velop. Quite impressive, isn’t? If you look at the performance of the Samsung device, its performance, and feature of prioritization are quite similar to Google WiFi. Its feature of repairing itself if something goes wrong is quite impressive. In case of some issue, it connects the user to the nearest point, so that network is not interrupted and the consecutively is smooth and preserved. Like Google WiFi and Linksys, this system works on 802.11ac mesh protocol rather than an advanced tri-band protocol like Netgear Orbit. The test concludes that it performs better than google WiFi at 2.4 GHz. Ultimately, Samsung Smart-thing Connect is a fine mesh wifi router, which also a smart hub. It is a great design, plus great connectivity and feature. If you are looking for something stylish, smart and powerful connectivity, then it’s the right choice for you. If you are looking for a smart home, then it should be your first consideration because along with smart home it also provides fine WiFi connectivity. Well, you don’t need to be confused with the previous edition of the company. 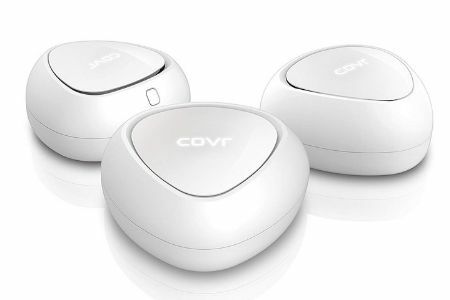 Last year D-Link has released Covr AC3900 Whole Home WiFi System. Where they have combined a traditional router with the mesh points the spread out the signals to every corner of the house. This new D-Link Covr dual Band Home WiFi system is a Mesh WiFi network, which uses beautiful WiFi nodes to to scatter the signal to every corner and cover the dead-spots of the house. This device claims that it can cover up to 5000 square feet. This system consists of three triangular nodes with round edges. All the three devices look identical but they are divided into one router and two identical satellite devices. The main is marked with A and a little bigger then the (2.0 x 4.6 x 4.2) inches satellite devices. The top of the device contains a logo of Covr that blinks and show the status of the device. If the device is online, it blinks as solid white but if the device in configuration mode, it blinks orange. Each node of the D-Link Covr device contains three antennae’s and 802.11ac circuitry. This device works on dual frequency of 2.4 GHz and 5 GHz. The speed of 2.4 GHz is 300 Mbps and 5 GHz is 866 Mbps. This device uses the auto band steering and changes the node to the user as per the best signal. If you are roaming inside the house, it will connect to the nearest and strongest signals. The dual-band 2.4 GHz and 5 GHz work together and cannot be separated from each this. this device use MU-MIMO (Multiple user, multiple input, multiple output) technology and direct beam forming to clients. On the back of the device, there gigabyte LAN ports for supporting the back-haul to the router, power button for AC Adapter, a WPS button and there is also a dedicated button to open the cover plate of the device. The reset button is placed on the base of the device. This device has a dedicated IOS application, which has basic features but if you want use the advanced features like QoS, Website filtering, parental controls and Port Forwarding, you will need to login from the web browser. It lacks the built-in anti-malware like all others Deco M9 plus and Asus Lyra Trio systems provides. Great features and lower price adds this device to the line of best mesh wifi 2019 routers. This system can be installed on both the platform of mobile or desktop OS. It’s very easy to setup. All you need to do is open the app-store of your mobile. Its available for both the operating systems IOS and Android. Download the application. After installation of the application, scan for the devices, you can connect it through QR code. It will scan for the device, select Covr 1203 and tap next on the screen of the smartphone. Search for Labelled A device, which is your main router. After powering up the router, orange LED will start blinking, it’s time for installation and configuration. In configuration, you need to give your network a name for identification and a password to protect. After the configuration of the A labelled router, now it’s time to configure the other nodes of the WiFi mesh network. Which includes the exact same procedure, except you won’t need to set network name and password again. This router supports both SU-MIMO and MU-MIMO WiFi technology. Performance on the Technology were respectable at close proximity test. The speed of the internet at close distance is very good and it beats a lot of its competitors. Over all the performance of this device is very good. This device is capable of delivering solid signals. It can cover from mid-sized to large sized homes. The design of the device is great and its setup is very painless. The performance of D-link Covr is enormous at 5 GHz band, allows seamless connectivity, while moving in the house from one place to another. Along the app, it provides web browser access with certain advanced features. So, overall the performance of the device is enormous, the design is great and very easy setup. Every penny of this device is worth it. While choosing the best product for your home or office. You should keep in mind certain things. Its not always about buying the best product, you should consider the all the factors and choose the right product for your home. Choosing the right product is not quite easy, you should look on all the aspects. Each product is design for different environment, some product are good for small house, some are designed for bigger environments. Also budget is the another aspect. The first thing that really matters is the budget. If you have no problem with the money, then you should really go for the high priced product because they are tri-bands, have the ability to self heal, long distance coverage and seamless connectivity. But if you are tight on budget, there also great product available on affordable prices. Design it the another factor which really matters. Some product have very beautiful design, some are small sized while some are bigger in size. Also many of them have LED’s to tell the status of the connectivity based on the strength of the signals and also tell you if something is wrong. Some of them even comes with a touch screen, which makes it very easy to set up and manage. This is the most important factor to consider, before buying the device. First, decide what do you really need. Do you have a big house with a garden outside? or you live in a small flat. Is your office have many floors? or its just medium sized office. Some of the products have around 6000 square feet coverage. If you live in small apartment or small office, then you should not go for the high end devices because they are specially designed for large homes and building with multiple floors. Functionality is the another basic factor in choosing the best product. Some of the devices or controlled via smartphone application while others can be controlled by both web browser and smartphone app. Many of the devices allow its user to use the advanced functionalities while some have the restriction. Now its up to you, whether you are a tech geek, who likes to play with the advanced feature or you are just a normal user. Parental controls are also a functionality to consider while buying the product. Devices have the features but some lacks complete control while others have great features. Also some of them are more secure and comes with a default malware program. User Interface is very important factor. Before buying the product you should consider it because if you are not a tech geek, it will be a great problem in the end for you. All the devices comes with Android application and they are very easy to setup. Some of them also have browser interface and allows to toggle advanced features. This is time where you get to decide, which product is best for you. We have tried our best to carry out the best products in the market and review them. We update our articles from time to time. You can always come back and check, if there is something new in the market. We select our products through proper procedure. After a thorough research and testing the product is reviewed.